Are you shopping to find the perfect gift for the Marvel fan in your life? Well Upper Deck Entertainment has you covered with a variety of releases that are sure to put a smile on their face. Check these out! “Legendary” is quickly being embraced as one of the best deck-building games of the year. Everything you need to play and enjoy the game is right in the box which includes over 500 game cards featuring awesome new artwork of top Marvel characters! The game was designed by Devin Low, the former Head Developer of “Magic: The Gathering®.” In “Legendary,” each player starts with a deck of basic cards and then improves that deck throughout the game by recruiting Marvel’s greatest heroes like Spiderman, the Incredible Hulk and Wolverine in an effort to take down evil Marvel super-villains like Sabertooth and Dr. Octopus. 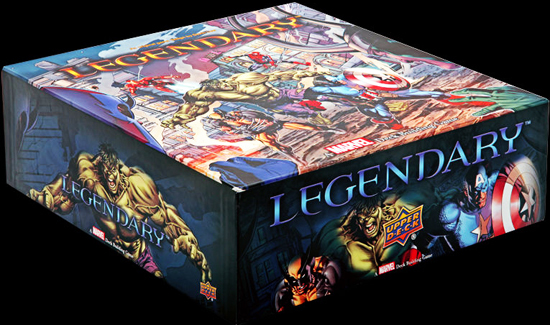 Unlike other deck building games, in “Legendary,” the game actually fights back, with an evil mastermind like Magneto working on a dark scheme to crush all the players at once. Players will have to work to defeat these masterminds while managing conflicts that occur with each other in order to win. The game can be played with as many as five players and it can also be played solo with just one player. 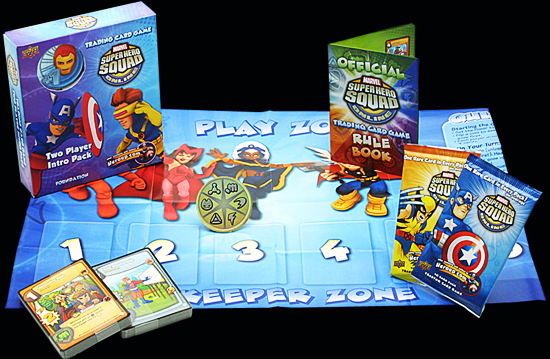 There is a very compelling trading card game which is an element of the Marvel Super Hero Squad Massive Multi-Player Online Game. Previously it only existed online, but now Upper Deck has brought the game to life with physical, collectible Marvel Super Hero Squad trading cards. Marvel fans can get started with Intro packs and then add to their decks with Booster packs! Do battle with iconic Marvel Characters like Thor, Spiderman, Wolverine, Iron Man, Captain America and many more! If you are shopping for a younger Marvel fan, we’ve got the perfect gift for you with Marvel Slingers! This highly addictive game gets kids moving with a Slingers unit they “sling” at collectible medallions to retrieve them. There are a variety of games that can be played with the Marvel-themed Slingers units and medallions for hours upon hours of enjoyment!